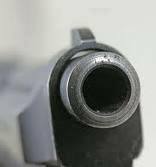 Welcome to the latest instalment of 9mm, where a terrific crime storyteller puts their back up against the wall and stares down the barrel of nine questions, giving all of us more of an insight into them and their writing. I'm very pleased today to welcome to Crime Watch the fabulous Lin Anderson, acclaimed creator of the Rhonda McLeod series and a Queen of Tartan Noir. 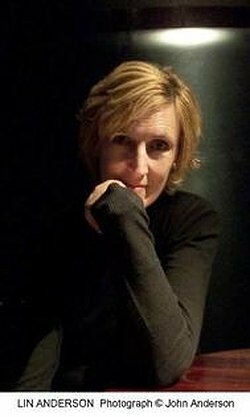 She also has an interest in film-making, having written award-winning screenplays and a non-fiction book on the making of Braveheart. But for now, Lin Anderson stares down the barrel of 9mm. I began with Christie’s Poirot, deserted him for PD James’Adam Dalgleish, fell for Patricia Cornwell’s Kay Scarpetta, then Karin Slaughter’s Dr Sara Linton. More recently ‎Andrea Camilleri’sInspector Montelbano. In between there have been countless others and hopefully more to come. After all, a crime novel is really about the characters, not the crime. I read countless adventure stories starring the Famous Five. No absolute favourite though. Perhaps the first book that really affected me was To Kill a Mocking Bird by Harper Lee. It was a coming of age story, a crime story, a mystery and a moving tribute to how to be a good person in bad times. A collection of short stories set in northern Nigeria, where I lived for five years, which were published in various anthologies and broadcast on BBC Radio 4. A play developed through 7:84 theatre company’s new writing scheme, performed at Ayr Gaiety Theatre. A drama for STV. Walk in the woods in my home village of Carrbridge. I like wild swimming – at Dulsie Bridge or Sluggan, both deep river pools nearby. I spend an equal amount of time between Edinburgh and Carrbridge. If in Edinburgh I love eating at The Three Birds in Bruntsfield – unique and highly recommended. As for Carrbridge – definitely take the river walk over the swing bridge built by Gurkas. 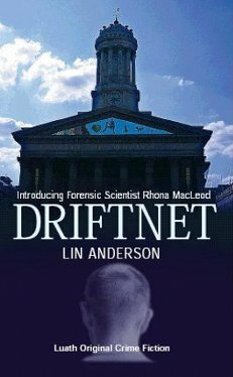 Driftnet, the first in the series featuring forensic expert Dr Rhona MacLeod. Making her a forensic scientist, was the best fun ever, and still is. Driftnet got me an agent, but I found a publisher for it, Luath Press. By then I’d written three books in the series and they took all three. Ottakers made Driftnet their book of the month and it launched in the party tent at the Edinburgh Book Festival. I was still teaching at the time and all my colleagues came. I was shaking so much I couldn’t sign the books properly and kept forgetting peoples’ names. Drinking prosecco with Alex Gray at a Crime Writers Association conference, where we dreamed up the idea for Bloody Scotland. It doesn’t come stranger than that. Thank you Lin. We appreciate you taking the time to chat to Crime Watch.